This dataset provides project-level data on estimated Official Development Assistance (ODA) commitments to the 17 Sustainable Development Goals (SDGs) from 2000 to 2013, tracking more than $1.5 trillion in financing cross-walked to the SDGs from 1.2 million ODA projects in AidData's Core Research Release 3.1. This dataset includes all geocoded projects in Burundi's Development Assistance Databased (DAD). It tracks more than $5.8 billion in commitments for 930 projects across 7,562 locations between 1988 and 2014. This dataset includes geocoded projects from Sierra Leone's Development Assistance Database (DAD). This dataset tracks more than $3.3 billion in commitments for 856 projects across 2,314 locations between 1992 and 2014. This subnationally geocoded dataset, available via request from Afrobarometer, covers Rounds One through Six of Afrobarometer's surveys in 37 African countries between 1999 and 2015. It provides hyperlocal, time-varying information about the priorities, preferences, experiences, and opinions of more than 200,000 African citizens in 28,000 localities. This sub-nationally georeferenced dataset of Chinese official finance activities between 2000 and 2014 tracks $149,159,306,133.72 of commitments in three ecologically sensitive regions -- the Tropical Andes in South America, the Great Lakes of Africa, and the Mekong Delta in Southeast Asia. This first-of-its-kind geocoded dataset contains all known natural resource concessions granted to investors in Liberia from 2004 to 2015, categorized on 43 different dimensions. The release contains 557 concession licenses sourced from both official systems and transparency initiatives in Liberia, along with additional information collected using AidData's TUFF open-source data collection methodology. AidData's Core Research Release 3.1 is a corrected snapshot of AidData's entire project-level database from April 2016. This database includes commitment information for over 1.5 million development finance activities funded between 1947 and 2013, covers 96 donors, and includes ODA, OOF flows, Equity Investments, and Export Credits where available. This dataset contains all geocoded projects in the 2013 funding appeal from UNOCHA's Financial Tracking Service (FTS) 'Central African Republic 2013' source dataset. It tracks $102,801,363.00 in geocoded disbursements spread across 179 geocoded projects in 445 locations. This geocoded dataset represents all natural disaster records in EM-DAT's database for the Philippines between 1980 and 2012. The "disasters.csv" file contains 421 records pertaining to individual disasters, and the "locations.csv" file contains 1815 location records that relate (many to one) to corresponding records in the "disasters.csv" file. This geocoded dataset release represents all projects in UNOCHA's 2015 flash appeal for the Nepal earthquake available from the Financial Tracking Service (FTS) at fts.unocha.org as of February 19, 2016. It tracks $280,218,108.00 in geocoded disbursements spread across 156 projects in 852 locations during 2015. AidData's Core Research Release 3.0 is a snapshot of the AidData's entire project-level database from April 2016. This database includes commitment information for over 1.5 million development finance activities funded between 1947 and 2013, covers 96 donors, and includes ODA, OOF flows, Equity Investments, and Export Credits where available. This geocoded dataset release represents projects that were active in Bangladesh in 2014 from 9 select donors: USAID, JICA, World Bank, Asian Development Bank, EU, India, UNDP, Islamic Development Bank, DfID. It tracks 288 geocoded projects across 3641 locations and $18,924,503,171.06 in geocoded commitments between 2000 and 2015. This dataset includes all geocoded projects in the DRC's Aid Management Platform (AMP). It tracks over $4 billion in commitments for 256 projects across 1,750 locations between 1998 and 2014. This dataset includes all external assistance projects in Afghanistan's Development Assistance Database (DAD). It tracks more than $16 billion in commitments for 1,561 projects across 7,168 locations between 2001 and 2014. This dataset includes all geocoded projects from Nigeria's Development Assistance Database (DAD). This dataset tracks more than $2.1 billion in commitments for 595 projects across 1,843 locations between 1988 and 2014. This dataset includes all external assistance projects in Iraq's Development Assistance Database (DAD). It tracks over $10 billion in commitments for 1,324 projects across 3,624 locations between 2002 and 2014. This dataset includes all geocoded projects in Colombia's Aid Information Management System (AIMS). It tracks over $800 million in commitments for 665 projects across 2,981 locations between 1994 and 2014. This dataset includes all geocoded projects from Nepal's Aid Management Platform (AMP). It tracks over $5.9 billion in commitments for 475 projects across 20,952 locations between 1997 and 2014. This dataset includes all geocoded projects from Uganda's Aid Management Platform (AMP). It tracks more than $12 billion in commitments for 565 geocoded projects across 2,426 locations between 1978 and 2014. This dataset includes all geocoded projects from Senegal's Aid Management Platform (AMP). It tracks more than $7.2 billion in commitments for 856 projects across 2,314 locations between 1992 and 2014. This dataset includes all geocoded projects in Honduras's Aid Management Platform (AMP). It tracks over $3 billion in commitments for 379 projects across 5,028 locations between 1995 and 2014. This dataset includes all geocoded projects from Timor-Leste's Aid Management Platform (AMP). It tracks more than $1.5 billion in commitments for 499 projects across 3,506 locations between 1998 and 2015. This geocoded dataset includes all external assistance projects in Somalia's Development Assistance Database (DAD). This dataset tracks more than $2.3 billion in commitments for 1,210 projects across 3,130 locations between 2000 and 2014. This dataset systematically covers aid flows from 227 Saudi Arabian projects to 17 recipients across the Middle East and Africa from 2010-2013. It includes both official development aid (ODA) as well as non-concessional lending and Other Official Flows (OOF) from official and semi-official government agencies and officials within Saudi Arabia. The 1.1 version of AidData's Chinese Official Finance to Africa dataset tracks 1,955 development finance activities in Africa from 2000 to 2012. The data includes both Chinese aid and non-concessional official financing. The 1.0 version of AidData's Chinese Official Finance to Africa dataset tracks 1699 development finance activities in Africa from 2000 to 2011. The data includes both Chinese aid and non-concessional official financing. This dataset contains data for aid project locations in South-of-Sahara nations that experienced conflict between 1989 and 2008. This dataset contains geocoded aid locations from 30 donor agencies in the Malawi Ministry of Finance's Aid Management Platform. The data include US$5.3 billion in commitments, representing approximately 80% of all external funding reported to the Malawi Ministry of Finance since 2000. AidData's Research Release 2.1 is a snapshot of the AidData's entire project-level database from February 2012. This database includes over 1 million aid activities funded by more than 80 donors from the 1940s to present. For detailed information about this data set, see the AidData User's Guide. 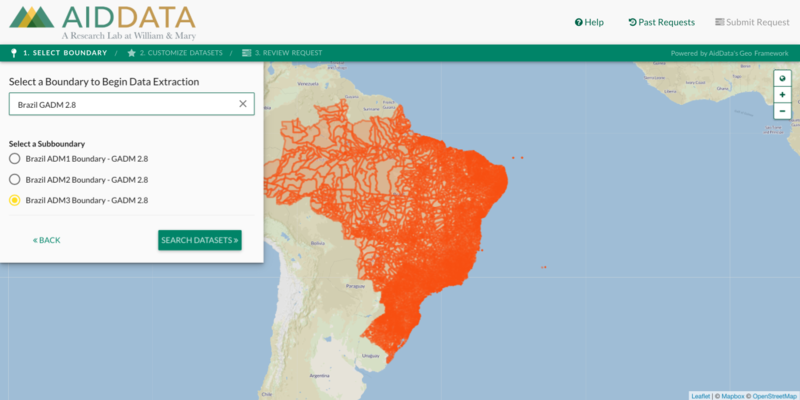 This raw dataset contains records in Portuguese for Brazil's South-South cooperation projects from 2005 to 2011, provided by Agência Brasileira de Cooperação. Provided by the Taiwan International Cooperation and Development Fund (TaiwanICDF), this table provides detailed descriptive and financial information about Taiwan's development-oriented lending and investment projects since 1991. These 68 projects have been integrated into AidData, and have received AidData sector and activity codes. These 73 project records were gathered from the 2009 project list released by the Development Cooperation and Democracy Promotion Department of the Ministry of Foreign Affairs. They are provided with Lithuanian descriptive information, automatically translated English descriptive information and commitment amounts in Lithuanian Litas. These 895 records were gathered from the annual reports of the Liechtenstein Development Service. This dataset has AidData sector and activity codes applied, and is formatted and translated into English. This geocoded dataset contains nearly 2,500 active World Bank projects in over 30,000 locations across 144 countries that were approved between 1997 and 2011. This dataset is comprised of donor-provided financial information complemented by descriptive information from the public domain for 27 cooperation projects funded or co-funded by the government of Cyprus. It contains a list of scholarships provided by the Development Cooperation of Cyprus (without financial information). This dataset contains all African Development Bank activities approved in 2009-2010. In total, there are 183 projects worth over $15 billion in total funding, working in nearly 2,000 locations across 43 African countries. The work was featured in the AfDB's 2011 Annual Development Effectiveness Review. These 1,274 records provided by the Czech Development Agency (CzDA) have financial and descriptive information, as well as unique project IDs. They have been translated, screened, and coded by AidData staff. This document contains descriptive information for 25 technical cooperation projects by Israel's Agency for International Development Cooperation (MASHAV), which are also included in the AidData database. Financial information was not provided for these projects. This dataset of 1,513 projects draws information from a public EBRD database as of December 2009. The dataset includes financial information, environmental impact, and other project information as well as links to the original source for each project. This dataset of 2,740 projects draws information from a public DFATD database as of March 2009. The dataset includes financial information, information on executing agencies, sectors, and project abstracts, as well as links to the original source for each project. Information for this dataset was pulled from a publicly available KOICA database in February of 2009. It includes 29,549 KOICA projects covering 1991-2007 and totaling nearly $1.5 billion in commitments. AidData sector and activity codes have been applied.